Founded by Tareese "Reis" Chester, Reisfields is made up of like-minded creatives who seek a constant progression of high-end material goods inspired by the unconventional sense of style and sophistication of modern-day New York City. Reisfields currently produces a luxury line of hand-crafted candles with additional products being tested as we speak! So far, the company’s site consists of 6 distinct beautifully crafted luxury candles. Scents inspired from leather, vanilla, brown sugar, sandal wood, floral aromas and so much more. Reisfields luxury candles begins with an exclusive soy wax, which is then complimented with their patented blend of fine phthalates-free fragrance oils infused with essential oil blends, all poured into a stunning eco- friendly glass that has been recycled in the U.S., and finished with a natural lead-free cotton wick for optimal burn performance. The company strives to make luxury products affordable for all of their customers, as they believe that the true art of retail lies within craftsmanship, service, and of course, the thrill of the purchase. 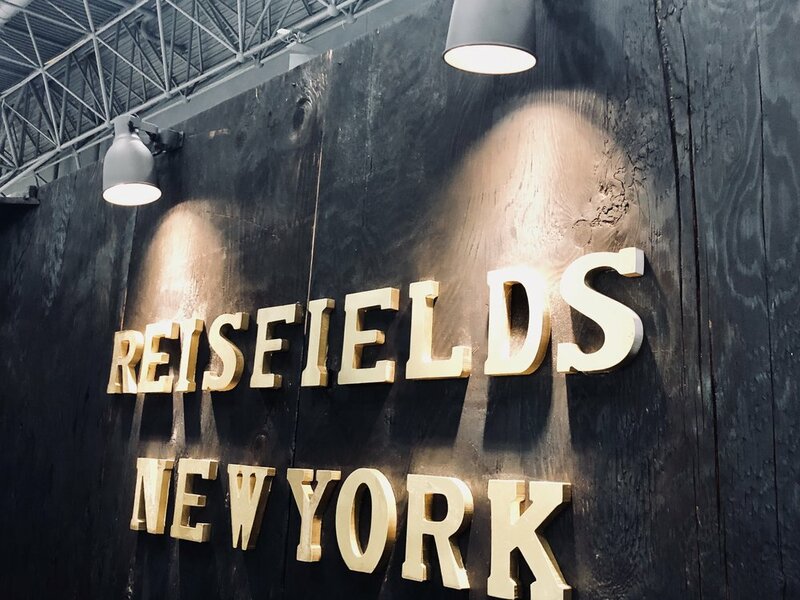 Look out for Reisfields as they grow and root themselves as a multifunctional lifestyle brand with a plethora of fun and essential quality products for every taste, style, and interest alike. I caught up with founder Reis for a very eye-opening interview into the struggles and triumphs of a modern-day entrepreneur. What grew your passion for fragrances? Reis: It started when I was younger. My mom would always throw parties at our home in Brooklyn. I remember the smell of candles and oils burning throughout the house, seeing the glowing flames dance about the living room and dining room areas. Growing up, you tend to pick up on certain things, and I realized quickly from these parties that it’s important to smell nice, whether it be your personal hygiene or your personal belongings—really just your overall general personal space! Scent is very important to us. That’s why we shower, why we use perfumes, and spend all of our money on those cute little essential oil diffusers. We’re obsessed with smell. Mom always understood that, and that’s why she instilled in me the importance of great first impressions, to which, smell plays a huge roll. We pretty much do our best to make lasting impressions here at Reisfields. What was the hardest thing for you getting started? Reis: Just that. Getting started. Getting my product, my business, off the ground. I went to school for business and prior to me founding Reisfields LLC, I had already acquired a decade of work experience in the retail industry, and yet I couldn’t have prepared myself for the amount of grunt work I faced in the beginning. The amounts of research that goes into creating a product and then shaping said product to fit your intended market, it can all be very overwhelming to say the least. However, early on I knew I wanted to start my product line with luxury candles. So, once I had that figured out, I then had to research competition, what makes them stand out, price points, types of customers, manufactures, etc. Once I did all that, I had to really ask myself if this was what I wanted. Cut forward to today, and I’ve probably asked myself that same question 100 times. The hardest part about starting a business is staying motivated enough to keep going. Once you’re able to persevere, everything will fall into place. I think it was Obama who said that, if you’re willing to continue down the right path, you’ll make progress. What does a typical day look like for you as a business owner? Reis: Even though I’m a business owner, I still have a 9-5 to support my business as well as my livelihood. I’m very strategic with my time; I must fit in tasks for my business wherever I can, because I’m working around my 9-5. My day usually starts at 7am with me checking orders to see what I have to drop off at the post office to be shipped. I try to get as many orders packed and ready for drop off before I head off to my day job. After work, I try to complete any orders I couldn’t get too earlier in the day. Any time I have leftover in the day is spent on researching the next step in the development of my product line. What challenges have you come across that you didn’t expect? Reis: One challenge I didn’t anticipate was the initial push back from those around me when I first got started. I got a lot of side-eyes whenever I shared my vision to sell high-end luxury candles. Now I understand that the average consumer may spend $5 to $20 on candles and may be totally uninterested in a candle higher than what they’re used to. And that’s okay, right? Because there’re so many ways to achieving a beautifully scented room. However, some are more effective than others, and that’s where our luxury candles come in. If you’re looking for a bold, layered, yet subtle scent that’s long lasting, then you should purchase a Reisfields candle. If you’re looking for a clean burn experience that doesn’t saturate your air with added chemicals, then you should purchase one of our natural soy-based candles. But what I learned from all that was that by educating my intended market about the quality and providing insight on the inner workings that goes into producing a luxury candle I get a better reception of my products. People deserve quality, and so, basically, I learned that reconditioning my intend market to understand that they deserve quality, is just another part of the job. What do your candles have in common with Newark? Reis: I’m originally from Brooklyn, but I have some roots in Newark. My husband is a Newark native. He’s the most talentedly ambitious person I know, and he’d be the first to tell you that he’s just one of many that come out of Newark. And after 3 years of living here, I can definitely say that the people of Newark have a deep passion and belief in what they do. There are so many young, talented, and hungry entrepreneurs here. It’s so diverse! Newark is gearing up to take center stage in becoming a major player on the map. It’s an exciting time for Newark and its people, and that’s why I feel like Reisfields and Newark, both have something to fight for. Newark has just as much talent as big cities like LA and NY, we just need to foster it. My product can match the quality of luxury candles found in France, I just need to get it out there. We both are fighting to prove we belong. What do you think of the Makerhoods mission? I think it’s amazing. As a business owner that also has a 9-5 job I know firsthand the struggles that come with maintaining a living wage while also trying to pursue a passion. So the fact that Makerhoods provides both residential and commercial space under a single affordable price—that right there solves about half of my problems. And I’m so happy that it’s all taking place right here in Newark. Like as I said before, the population here is so diverse with black and brown people who come from all walks of life—gay, religious, etc. Brooklyn and major cities around the coast are witnessing a transformation where the effects of gentrification and development can lead to marginalized communities playing catch up in a race to economic sustainability. Makerhoods’ mission is a great step in the right direction, by providing opportunities and access that can create a fair playing field for all here in Newark. What advice would you tell your younger self? I would say to anybody out there ready to jump headfirst into the entrepreneurial business world, take your time but still be productive. Rushing to get to the end goal, whatever that might be, is never the best way to go. Take your time and do the research. I can’t emphasize that enough. Here’s a quote I reference a lot when I need some motivation, “luck is when preparation meets opportunity.” Do your research! So when you’re ready, your product is at 100%. After graduating college and returning back to my hometown of Newark, NJ I became a member of the Newark Makerhoods team. This transformative experience put me in touch with many local entrepreneurs who are all in different business stages, ranging from established to upstart. Newark is a thriving city for talented creators. I'm here to share their stories and launch their business to the everyday public’s eye.